Tearbear is a Smash 4 Captain Falcon and Brawl Meta Knight player from San Diego, California. In Brawl, he is currently ranked 63rd on the 2014 SSBBRank and 7th on the SoCal Brawl Power Rankings, having taken sets off of top players such as Nick Riddle, UltimateRazer, Rich Brown, Will, and ESAM in Brawl. 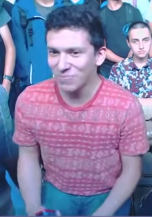 In Smash 4, he has victories over top players such as FOW, VoiD, Larry Lurr, K9sbruce, Tyrant, Zenyou, and Mr. ConCon. He also notably double eliminated one of Japan's top players, Nietono, in pools of EVO 2015 and garnered national attention after his 3rd place run at 2GGT: FOW Saga. He was formerly ranked 50th on the Panda Global Rankings v1 and 18th on the SoCal Smash 4 Power Rankings. This page was last edited on February 7, 2019, at 18:34.